I do not like the A143, the awful road between Diss and the east coast ports; the way it acts as a funnel for all the transport firms of the south of England, as their juggernauts race towards departures from Yarmouth and Lowestoft, makes it a nightmare to cycle. If I had to do it every day then I do not think I would last very long. Poor All Saints sits right beside it, with only a farm and a hard-standing area for company. The village, with its curiously spelt name, sits to the north. The church is kept locked, but I suspect that this is a mark of being in the Scole benefice as much as any dangers posed by travellers on the road. 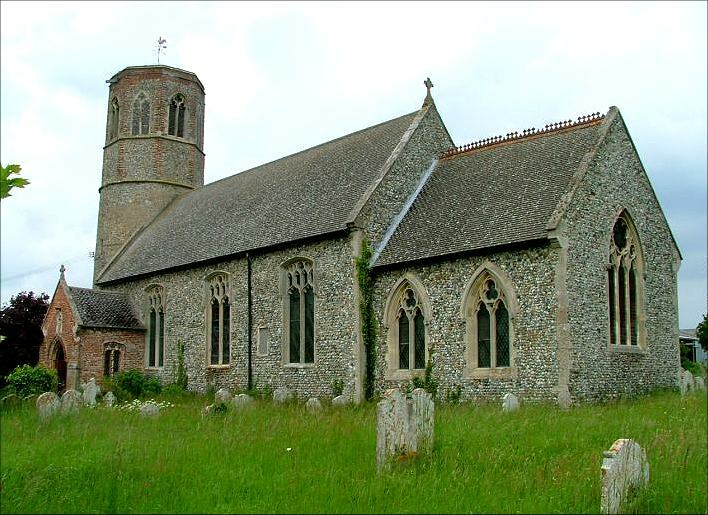 Few of the Scole benefice's churches actively welcome visitors, but Thorpe Abbotts is lucky in that it has a local historian, Simon Beet, as a PCC member who is happy to open up to those interested. You can contact him via the church website. Unfortunately, I had come this way without his name and number, and so I missed out on the opportunity on this occasion. Instead, I could only explore the outside, with its round tower. Mortlock says that this is Saxon, topped by late medieval additions. I wondered if the whole piece might be 13th century, and built in one go. The body of the church, as you can see, is most extensively Victorianised, but may be contemporary with the tower, and there are features of great interest within. Peter Stephens visited on a recent Historic Churches bike ride day, and some of his photos are below. 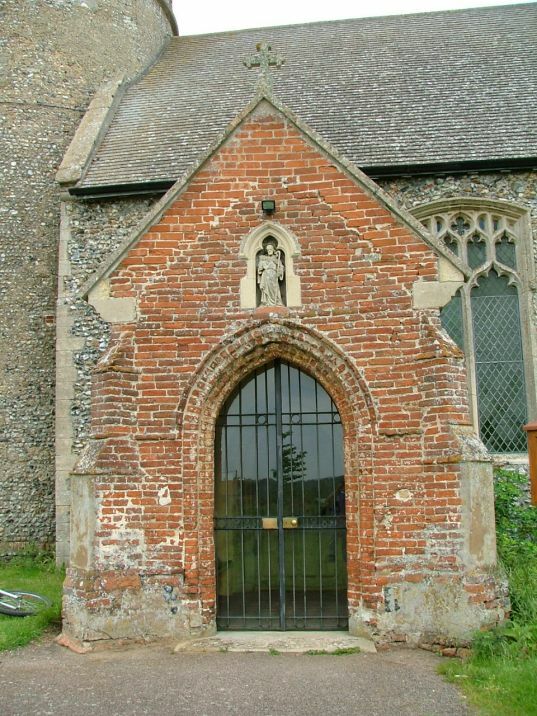 He found the person on duty to be extremely enthusiastic about visitors, which is excellent news in this corner of Norfolk where the Church of England can sometimes seem like an exclusive club to outsiders. He found a well-kept and typical country church, almost entirely refurbished in the 19th century but still with its medieval font and screen. This last is interesting because it is one of the documented examples of a font being plastered over by the Anglicans in the mid-16th century to hide its Catholic imagery - so much easier and cheaper than having it chiselled off or replacing the whole piece. The Rector of the 1840s saw that it was crumbling, removed the plaster and found wonderful things. Thousands more fonts had suffered the same fate, and were similarly revealed. I can only commend you to visit, and make it clear quite how much you value the opportunity.